ARP Engine & Accessory Fastener Kit - Lightning Motorsports - Selling Speed since 1996 ! 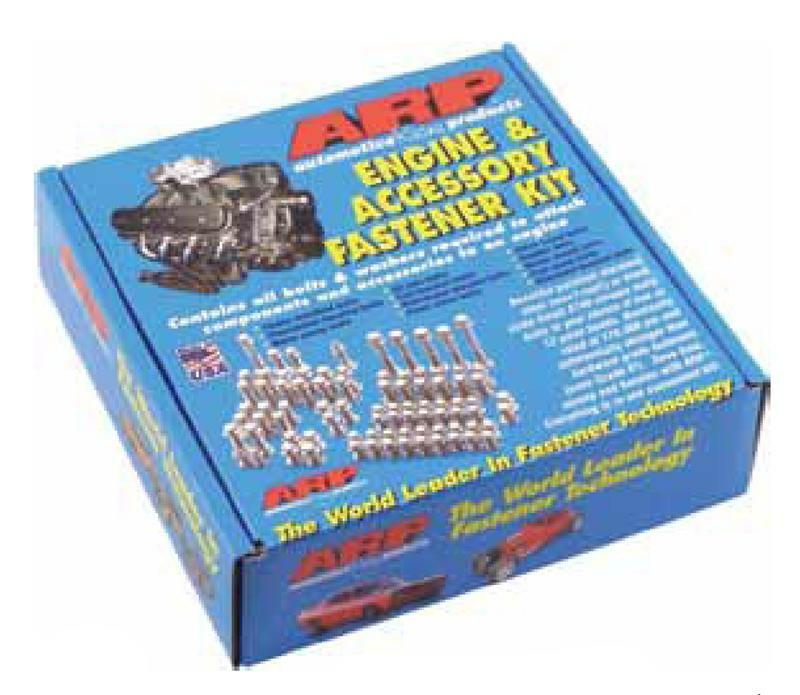 It’s easy to assemble a show-quality engine when you use ARP’s handy Engine & Accessory Fastener Kit. Virtually everything you need comes completely organized in one convenient package (no need to deal with twelve different part numbers)! More importantly, each and every fastener is superior in strength to the OEM bolts, and also significantly better than hardware grades (even Grade 8). You have a choice of two premium quality materials and finishes. Traditionalists will appreciate the strength and functionality of ARP’s heat-treated 8740 Chrome Moly steel alloy bolts, which feature a black oxide finish. Those who desire a dazzling engine will no doubt prefer fasteners made of ARP’s specially alloyed Stainless 300 material, which has the added benefit of being virtually impervious to rust and corrosion. The stainless steel is polished to achieve a brilliant luster, and provides a distinctive, maintenance-free environment. Each kit has a dozen different type fasteners, all neatly organized and labeled in protective vacuum-wrapped packages. Both materials are nominally rated at 170,000 psi tensile strength and come in both hex and 12-point heads. Please note that these kits are designed for carbureted engines. Newer EFI applications may require the purchase of additional fasteners.